An Italian factory, which over 150 years ago started to manufacture high-quality products for the measurement of forces in various fields of use and still today is a market leader. Originally Allemano's instruments were to be found on military vehicles and lately on industrial machineries. 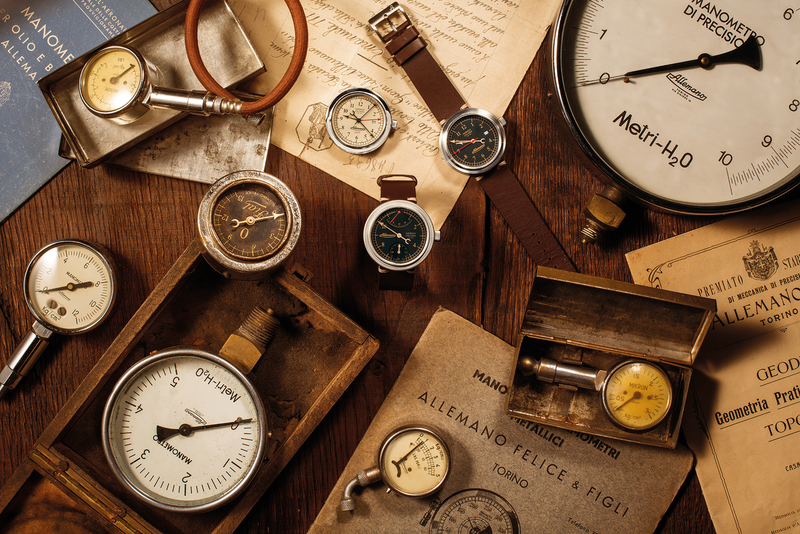 Today Allemano’s history is wearable on your wrist. Misuratori del Tempo: inspired by Allemano’s 1919 pressure gauge installed on board of the FIAT 501 Torpedo. MAN is perfect for a man who frees himself from time. Swiss made retrograde manual movement, Italian-made quality, sapphire crystal case front and back, 5 ATM water-resistant, all 316L stainless steel. GMT is the model for those who travel and spend their lives in between different destinations…and time zones. Swiss made automatic movement, Italian-made quality, sapphire crystal case front and back, 5 ATM water-resistant, all 316L stainless steel. The Misuratore del Tempo to deal with busy&business days, a challenging and valuable daily life. Swiss made automatic movement, Italian-made quality, sapphire crystal case front and back, 5 ATM water-resistant, all 316L stainless steel.